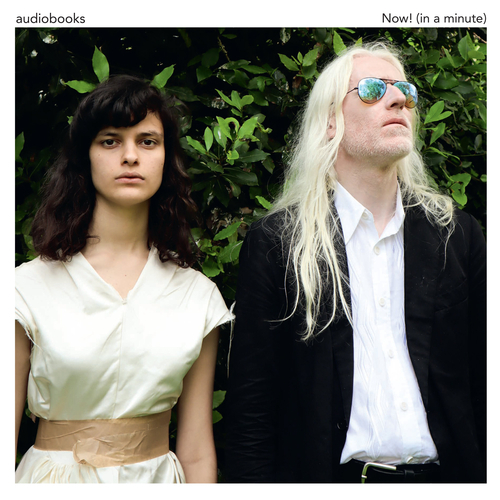 audiobooks release their debut album 'Now! (in a minute)' via Heavenly Recordings on November 2. Black vinyl with Download card. Limited signed copies available! From their first meeting, Evangeline and David’s friendship has been influenced by the records they flipped through in his newly set up studio in Old Street. Very quickly, the pair found inspiration in music by artists as di-verse as Bauhaus, Aphrodite’s Child, Marilyn Manson, Michael Jackson, Flower Travellin Band, the Fall, Faust, Tropicáalia and Dory Previn. Time, then, to welcome these strange superheroes – this inhuman league – into your life. You might not know it yet but the story is already written. It says audiobooks are your new favourite band.